Oak Ridge Teacher of the Year 2017 – Laura Dunn! At the Sandwich Public Schools Convocation on August 30, 2017, Oak Ridge Principal Trish Hill shared the following remarks about Laura Dunn. Laura Dunn is currently a grade 3 teacher at Oak Ridge. She previously taught in grades 1, 2 and 3 at the Wing School. In the past, I’ve come before you to celebrate teachers who embody values of service, dedication and excellence and today is no different. Being an educator is an investment of one’s self in the hopes and dreams of others. For over 30 years, the children of the Sandwich Public Schools have been the fortunate recipients of the talents of this amazing educator who embodies all of these characteristics. I’d like to welcome to the stage, Laura Dunn. Laura is a person of quiet strength and wisdom. Laura never seeks the limelight for herself, but is the beacon for those in need. During her time at Oak Ridge, she is a person that others have sought for advice, guidance and comfort. She is the consummate professional. She works hard, is thoughtful in her decisions and always puts her students first. Laura is unflappable and believe me there have been students who have tested that, but she remains steadfast. “No, so and so, we don’t roll on the floor here. You need to go to the take a break chair and when you are ready to behave appropriately, you can rejoin the group.” Even though on the inside she’s probably saying, “Seriously?! No seriously? Rolling on the floor!” By the way that was a real student we were just talking about earlier this week. After she shared that story, she still spoke about how proud of how much he had grown. In notes to that child’s new teacher I wrote, please be sure to talk to Laura about what kind of magic she sprinkled on him. That child is one example, but another of Laura’s many gifts is that she meets every student where they are. She knows her students as learners and believes in their potential. But it’s not just about believing they can for Laura. Laura sets a plan of action for each child. She tracks their progress and adapts to help them to reach their goals. Laura never gives up. Laura isn’t just supportive of her students, she is supportive of her colleagues as well. She has great respect for teaching and great respect for teachers. And although has served in the SEA over the years. Even when not a building rep, Laura is sought at by others. Maybe it’s because she is so knowledgeable, maybe it’s because she is unflappable or maybe it’s because of her wicked sense of humor. Whatever it is, Laura is the leader among her peers and a person I have been lucky to know as a parent of a child in her class, a colleague, as her principal and friend. 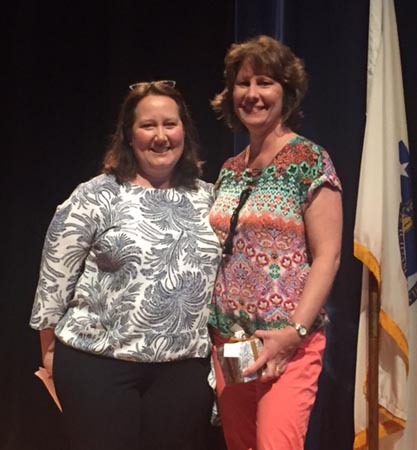 Thank you Laura for your dedication to the children and teachers of Oak Ridge and to the town of Sandwich. Please know you are appreciated, you are valued and you are loved! Please join me in honoring our Teacher of the Year, Laura Dunn.